Check out the P K Glitz Can Challenge here. This gift can was created for my son's teacher. Every year we try to give something back to the teachers he has and this is year we decided to give her some gift cards. We needed a container. It matches the card I made for her, highlighted in P K Glitz's June 5th blog post. 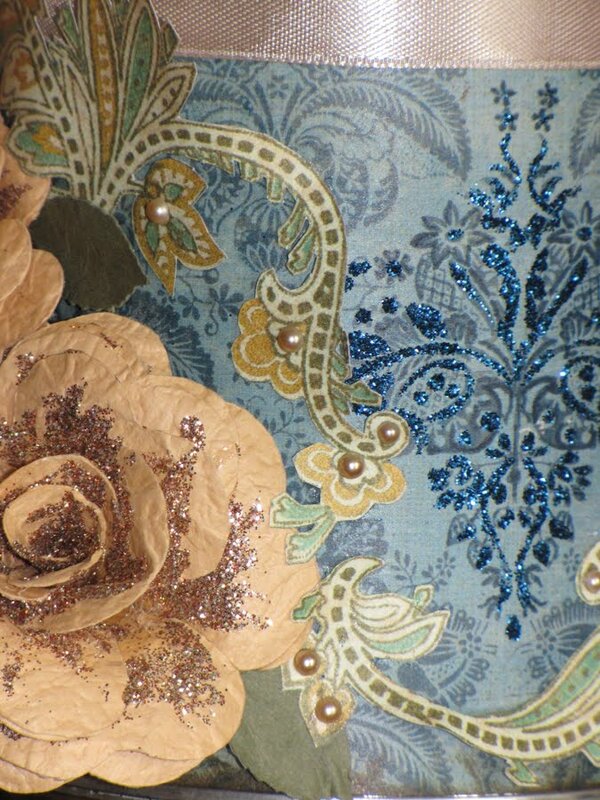 The details of the glittering on the flowers and the patterned paper designs were done by painting the glue onto the flowers or patterned design with a small detail brush. 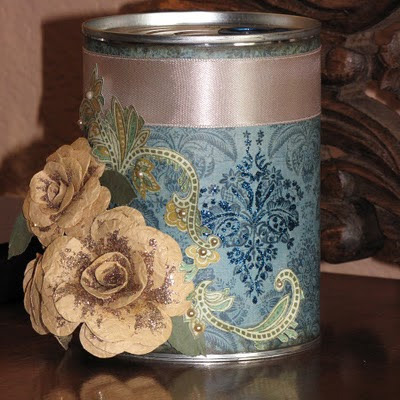 I chose to use Crafter's Pick Decoupage as the adhesive for this. It is one of the liquid adhesives I have that takes longer to dry. I painted a few petals then glittered them then painted a few more to avoid the decoupage gel from drying before glittering again. Same with the patterned paper detail. I would paint a small section then glitter it... then paint another. I chose not to paint the entire design on the patterned paper in glue to have it glittered. I left some of the design showing through and used a fine tip navy marker to shadow areas of the design after I used the glitter. This made it stand out more from the other patterns on the blue patterned paper. This close up shows the brush strokes on the petals and the detail of the glitter and marker in the pattern on the paper. 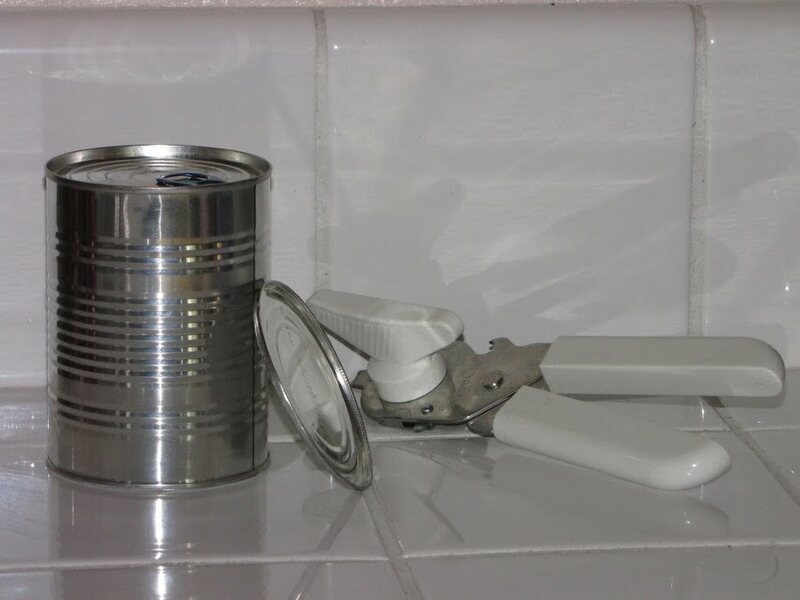 This can was first opened by a pampered chef can opener. However I know there are many companies that make these style of openers, the kind that cuts around the top of the can on its side. You should open this can from the bottom, with the can opener, leaving the pull tab at the top alone. This is key to create a gift can that has the pull tab top in tact. Empty and wash the inside of the can and bottom. You may re-stuff the can with the gift and tissue paper first, but I prefer to decorate it before I stuff and reassemble the can. Having one end of the can open gives me more control over holding it when doing the detailing of the designs. Once it is decorated stuff and reseal the bottom with a thin strip of tacky tape or a liquid adhesive that works well with metal. Thank you so much for reading about my projects. I hope you enjoy them. Love you take on the challenge (and your flowers!)! That is super neat how you openned the end of the can!! Love that idea!! What a sweet gift! As a teacher, I would be highly impressed if I received this from student. It means a lot when parents/students do this for their teachers. :) I am sure the teacher absolutely loved it! Great job. Wow. The details are amazing. You entered perfectly and you will be receiving an e-mail from Canvas People soon. Thank you for entering the DIY Club challenge in August. I cannot seem to find an email for you…so please email me and I will get you your Canvas People $55 coupon. What a pretty idea! I'm sure she will love it.